Bihar Assembly Election Results - 2015 brought back duo of Nitish Kumar and Lalu Prasad Yadav strongly on political map of Bihar and India. Counting of votes for election which was held in 5 phases during October and November resulted in thumping win for Mahagathbandhan. Out of 243 seats in Bihar Assembly, RJD-JDU-Congress bagged 178 seats crossing 2/3rd majority mark. While BJP led NDA who’s campaigned was centered on Modi-Amit Shah duo managed only 58 seats. Most surprised package of these results was RJD chief Lalu Prasad Yadav who made historic comeback on National political scene with 80 seats becoming single largest Party. Bihar voters decisively voted to bring back Vikas Purush Nitish Kumar who made hat-trick to continue as Chief Minister for next 5 years. 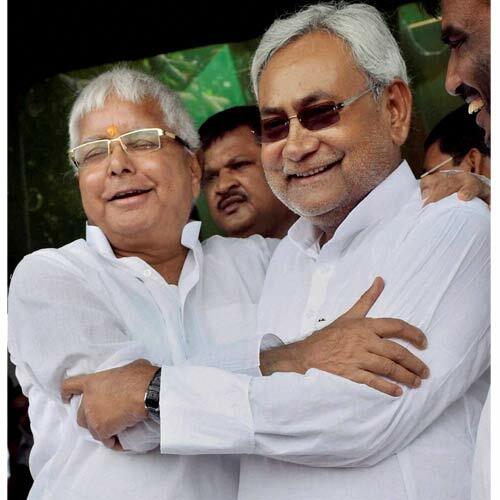 JDU won 71 seats out 101 which they contested while party got 64.2 lakh votes (16.8%). RJD with 80 out 100 seats got 69.95 lakh votes (18.4%). Bihar results came as big relief for Congress party which won 27 out of 42 seats getting 25.4 lakh votes (6.7%). The combination of Yadav and Muslim was intact with RJD-JDU coupled with considerable support from young and female voters who supported Nitish Kumar’s Bihar development model. For BJP, Bihar is second consecutive huge defeat after crushing in Delhi in the hands of Arvind Kejriwal led Aam Aadmi Party (AAP). The party could win just 53 seats out of 157 fought getting 93.1 lakh votes (24.4%). The dismal performance of its allies added woes of NDA as LJP (2/42), RLSP (2/23) and HAM (1/21) seats fared poorly in election. The wave for Nitish Kumar was such that BJP lost almost 5% vote share compared with Lok Sabha 2014 election. The RJD-JDU-Congress got 41.9% votes while NDA 34.1% resulting in landslide victory for Mahagathbandhan. Surprisingly, Shiv Sena which is ally of BJP in Maharashtra contested on more than 100 seats and got 2.1 lakh votes. They also managed to become catalyst for defeat of 3 BJP candidates showing their nuisance value. Bihar election results would have long lasting impact political scenario of India as non BJP politics would be centered around it in future. It would be interesting to see how BJP reacts to these results in coming days and make changes at both organizational as well as inside government. One is thing is for sure that in India, nobody should take common voter for granted and continuous performance evaluation goes on.